Abdul Mubeen thought Malvika Bajaj Saini was just passing through his village and home in Andar Shahar, Chanderi, in search of saris. It’s when she asked him if he would like to have his dilapidated house repaired that he realised this was more than just a tourist visit. Conservation architect Saini, at the Architectural Heritage Division (ADH) of INTACH, was part of a team that was keen on a pilot conservation project in the weaver cluster of Chanderi. In India’s tentative list for World Heritage Sites of 2014, there is an entry for ‘Iconic Sari Weaving Clusters’. 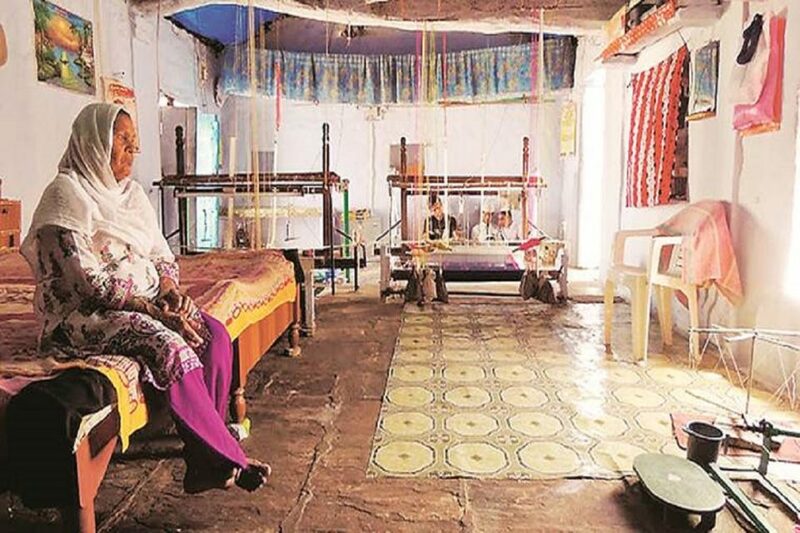 “INTACH has proposed a nomination of several world-famous sari weaving centres across India to draw attention to the tangible heritage of weavers’ homes, especially in historical towns such as Chanderi, Varanasi and Paithan,” says Aruna Bagchee, Project Advisor to ADH, in her report on ‘Vernacular Architecture of Handloom Sari Weavers in India’. She gave a talk at Delhi’s INTACH headquarters last week. Chanderi in Madhya Pradesh not only carries its gossamer fabric as a flag-bearer on fashion ramps but also wears its natural and cultural history of hills, step wells, forts and palaces proudly on its saris, through motifs and border designs. Of the nearly 30,000 residents, over 18,000 are engaged in weaving. Weaving here is a household and sometimes a community craft, where spaces within homes become active with the multiple processes of making a sari. From stretching the warp in the narrow gullies to bobbin winding and dyeing in vats to sitting in the pit loom at home and weaving the six-metre cotton-silk diaphanous cloth, the entire process is self-contained within organic home environments. INTACH partnered with two owners of a small single-storey structure and a two-storey haveli unit. “Weaving of silk and fine cottons requires management of ambient temperature and humidity levels. Extreme heat in summer leads to breaking of thread, while cold temperatures in winters lead to its sagging,” says Bagchee. Her report and field work by the INTACH ADH team testify to the effective mechanisms people have traditionally used in homes, from the locally sourced white sandstone (chinkari stone) that dresses up the 19-inch external walls to the shape and sizes of doors, to the stone (pataur) roof that allows for natural air flow, and mud and dung plaster flooring. In the two-storey haveli house, which belongs to Salim, wooden beams on the roof were replaced with stone ones. Instead of the thick tree branches that hold up the pataur roof, dense twigs were used to allow for air circulation, and large stone slabs took the place of the regular stone tiles. Parts of the stone walls were rebuilt and new doors and windows now give ample natural light into the hall and living area. Toilets too were added to both the houses.